Levi Rippy never intended to make a career out of refereeing. But with a referee assignor for a mother, dragging him from game to game every weekend, he was only nine years old when he first donned the whistle. “It was more fun to hold the flag than to stand on the sidelines,” he jokes. 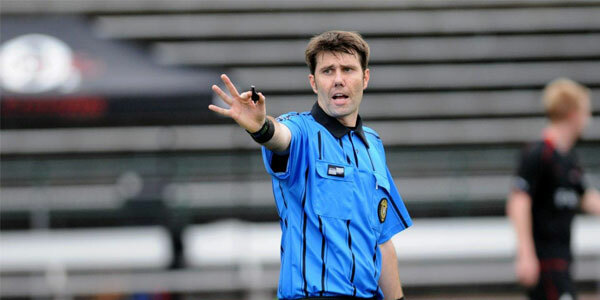 Now more than 20 years later, Rippy has risen among the highest levels of soccer refereeing in the United States, working US Youth Soccer National Championships, Division-I college games, and even MLS Reserve games. And he’s not alone — several Washington-based referees have, like the Evergreen State players they officiate, earned their way into the elite levels of their profession. Babocarr Jallo has worked as the reserve official at an MLS Cup final, while Jeff Hosking, Jeremy Hanson and Mike Rottersman have all worked MLS games. In addition, Josh Wilkens is one of the nation’s top college officials, serving as referee at the NCAA Division III Final Four earlier this year. After beginning his refereeing career just to stave off boredom, Rippy continued through college to earn some extra money on the side. After moving to Seattle in 2005 to pursue a Masters degree in architecture from UW, Rippy began to take his career more seriously, advancing through the grade levels before finally becoming a National referee last year. Rippy has since worked games for the US Youth Soccer National Championships, USASA Amateur Nationals, PDL and more. He is a frequent sight on soccer fields throughout the Pac-12, WAC and WCC Conferences, and has worked a number of MLS Reserve games as well. One game that stands out for Rippy in particular is a PDL game in 2012 featuring the Portland Timbers U23 team versus the Kitsap Pumas at Portland’s Jeld-Wen Field. Rippy walked into the game expecting the usual gathering of friends, family and die-hards in the stands, only to encounter a crowd of more than 8,000 screaming, cheering young soccer players — it was Youth Day at the stadium, and kids had been bussed in from throughout the area for the game. Rippy says that the most challenging aspect of refereeing isn’t the big crowds, or even dealing with the players and coaches. It’s finding time for the hours and hours of research that he does before each and every game, on the facility, the coaches, the players and all aspects of the upcoming contest. Rippy studies statistics to learn ahead of time which players are the most skilled, and which have a higher rate of fouls. He calls fellow referees who have reffed the teams in the past to learn any important notes he should know, and even studies the angle on which the field is built, to determine if the sun or shadows might obscure his view from any points on the field. The most important advice Rippy can give a young referee who’d like to one day join him and his fellow Evergreen State refs on the pitch at the highest levels of the game, is to ask questions. INTERESTED IN BECOMING A REFEREE? CLICK HERE TO LEARN HOW!